EPUB or electronic publication is an open book standard widely used for distribution of eBooks. Most open source formatted eBooks that are available for downloading in the Internet are of the EPUB format. Compared to EPUB, PDF files are extremely popular and are commonly used for saving publications in a standard format. PDF files are supported by PCs and mobile devices of almost all operating systems. Your EPUB files can be easily converted using Icecream PDF Converter. This application also allows easy conversion of documents from various formats including EPUB to PDF and from PDF to others as well. 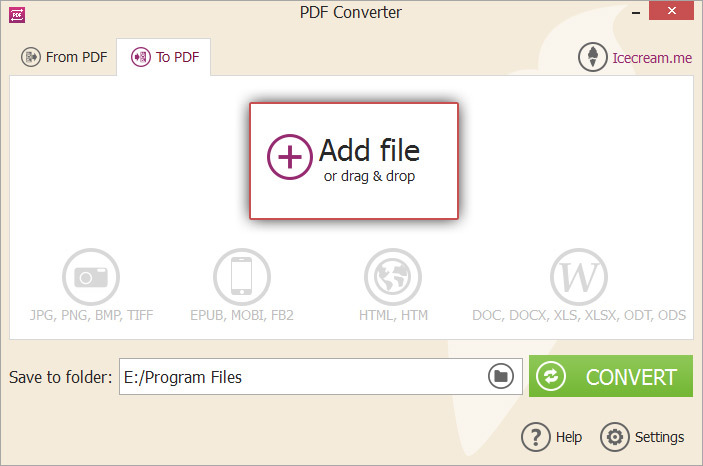 Follow the steps below to convert your documents from EPUB to PDF format. 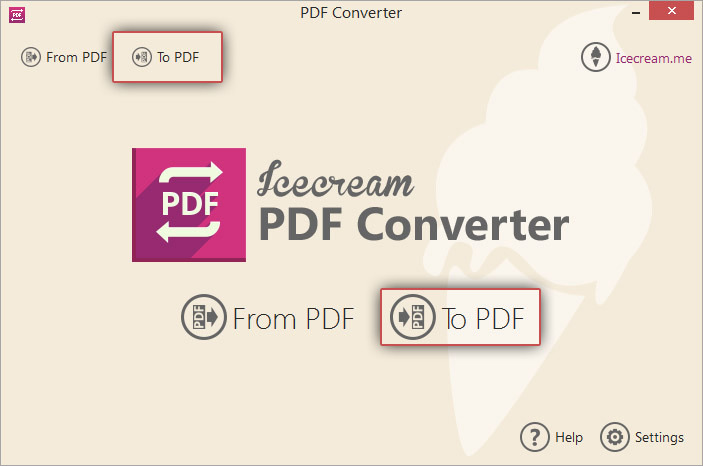 To start using the application, download Icecream PDF Converter. Open the downloaded setup file and follow the steps suggested by the installation wizard. 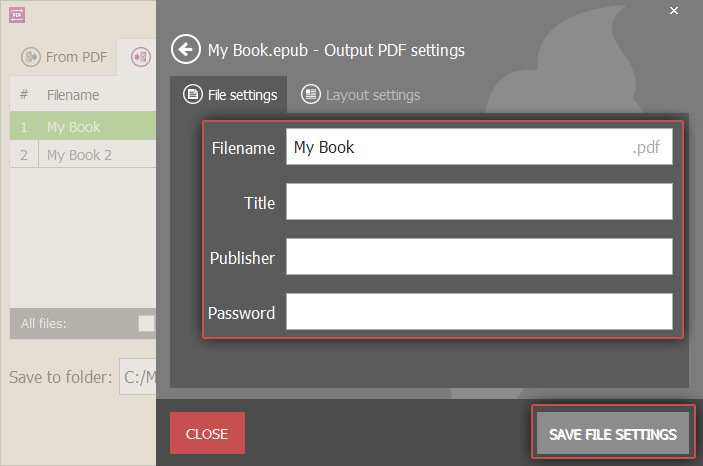 After the installation is completed, you can start using the application, add the EPUB files and convert them to PDF. Open the installed application and select “To PDF” option from the welcome screen. Press the Add file button to browse and select EPUB files. You can also drag and drop files directly into this window. If you wish to add more files to convert, select the PLUS (+) icon in the right hand side. Specify additional conversion options by clicking on the settings icon for each file. Specify settings for all files by clicking on the icon in the bottom of the window. The newly displayed settings panel allows you to enter such details as the filename, the title for the PDF document, publisher information. It is also possible to protect the generated PDF documents by entering a password value in this panel. Specify the required values and click “SAVE FILE SETTINGS” to save the changes and “CLOSE” to exit from this panel. It is also possible to merge all the eBook files into one PDF document using the “Merge all into one PDF file” option. Reorder the files using the UP and DOWN arrows in the right hand side of the window. If you are merging all EPUB files in one PDF file, it will contain the eBooks in the specified sequence. If you wish to remove any EPUB files, you can do so by clicking on the delete icon. Remove all EPUB files using the “Clear All” option or the delete icon in the bottom of the window. Select the target folder where the generated files will be placed by clicking the folder icon from the “Save to Folder” field. Browse and select the folder of your choice. The generated PDF files will be placed into this folder. Verify the settings and the selected files before you convert EPUB to PDF format. Start the conversion process by pressing the “CONVERT” button. The current status of conversion including the file and page numbers and the elapsed time will be displayed in the progress bar. You can pause and resume the conversion process any time by pressing the Pause/Resume button or cancel by pressing the Cancel button. After all files have been successfully converted, a confirmation message will be displayed with an option to view the generated files. Clicking on the OPEN FOLDER option will open the target directory where the generated PDF files are placed. You have now successfully converted your eBooks from EPUB to PDF format with the help of Icecream PDF Converter.